Supernovae come from stars many times our sun’s mass dying. 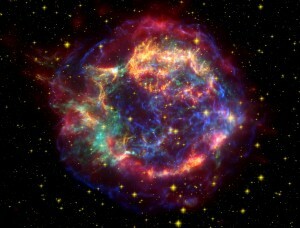 The resulting explosion leaves behind supernova remnants that are very beautiful. But why aren’t they spherical? The remnant of Cassiopeia A certainly doesn’t look spherical. Experiments in the UK using high powered lasers show that explosions that pass through a plastic grid create “knotty” results similar to the Cassiopeia remnant. This implies that the space the supernova exploded in isn’t uniform, there must have been some kind of turbulence there for the explosion to pass through. This entry was posted in Science and tagged astronomy, supernovae by Chris Riley. Bookmark the permalink.